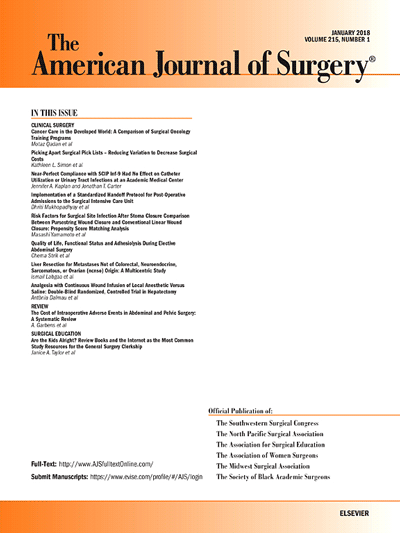 The American Journal of Surgery® is a peer-reviewed journal designed for the general surgeon who performs abdominal, cancer, vascular, head and neck, breast, colorectal, and other forms of surgery. AJS is the official journal of 7 major surgical societies* and publishes their official papers as well as independently submitted clinical studies, editorials, reviews, brief reports, correspondence and book reviews. As a benefit, a subscription to the journal and electronic access to the articles is included in Regular AWS Membership. Residents and Students can also subscribe at a special rate of $50 per year.